The DCX-18 ECO is an autonomous, rechargeable battery powered instrument. It features a stainless steel 18 mm in diameter housing designed to record pressure (water depth) and temperature over long periods at a very economical price. Its small size, rechargeable battery, fully welded housing and the relative sensor option are just a few of the many advantages provided by the DCX-18 ECO. The electronics employ the latest microprocessor technology which give high accuracy and resolution for the pressure and temperature signals. The measured values are mathematically compensated for all linearity and temperature errors of the pressure sensor. The use of a non-volatile memory for data storage ensures high data security. 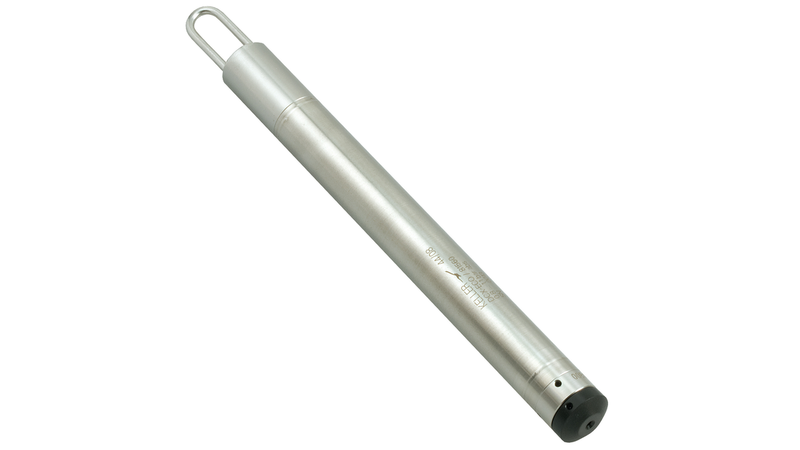 The sensor, electronics and the rechargeable battery are housed in a fully welded stainless steel tube for submersible deployment. For data read-out, the DCX-18 ECO must be recovered from the measurement point. The end cap, sealed by two O-Rings, must then be removed to access the serial interface. An optional cable is available for the DCX-18 ECO, enabling data retrieval or configuration and charging the battery without removing the data logger. For relative measuring devices, the cable incorporates a capillary tube which enables venting the relative sensor.